Many of us when it comes to Christmas meal planning have grand ideas. Of course we will cook everything from scratch. Naturally they will contain the finest ingredients to be prepared in the most complex recipes. Yet life has a way of getting in the way at Christmas. Shortage of time, unexpected guests and just plain exhaustion are all ways our plans can be scuppered. It's a good idea then to have a few backup items in your cupboards. With this mind I gave some of the products from Atkins and Potts a try. Whilst the Atkins and Potts range is produced in their Berkshire kitchens there are flavours and inspirations from around the world. One of the common Christmas problems is what to do with the turkey that is still lurking after Christmas Day. After all the preparation for the big Christmas dinner it's a good idea to keep it simple for some meals afterwards. As a complete contrast to the British Christmas dinner we tried out the Kashmiri Korma Sauce. 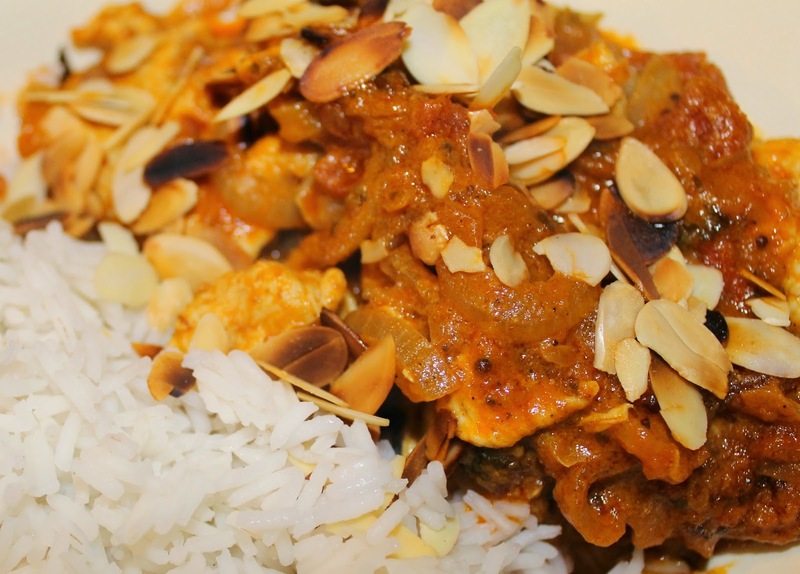 We used turkey breast pieces in it and took the suggestion on the back of the packet to add some flaked almonds. We also added extra onions because we always add more onions to our curries. This isn't the full on creamy Korma you may normally be familiar with. It has a slight heat to it but a lighter feel. For the prefect Boxing Day brunch or just a lazy weekend breakfast Eggs Benedict is perfect first meal of the day. Lightly toasted English muffins, ham or grilled bacon then a poached egg topped with Hollandaise Sauce. With muffins,bacon and eggs all to cook the last thing you need to do is make some notoriously tricky Hollandaise sauce. This comes in a jar which after opening can be stored in the fridge for up to four weeks. There are two other items I haven't tried yet. One is the Cranberry, Port and Orange Zest Finishing Sauce. It says it would go well with hot or cold roast turkey or gammon. At Christmas usually have duck or goose for our Christmas dinner. I think those flavours would go really well with the duck and cut through some of the fat. The other product is Rose syrup. This looks like a lovely fragrant syrup really to be poured over something simple like vanilla ice cream, meringue or a winter warming rice pudding. What are your favourite Christmas sauces and condiments? I was sent some products from Atkins and Potts for review purposes. All words, photographs and opinions are my own. I haven't heard of that brand, I do love the sound of the two products you have yet to try! I hadn't heard of it before either but there's a stockist near to where I live. Love the branding, Rose Syrup sounds like a brilliant addition to the larder. The curry looks gorgeous too. It is very smart branding. The curry was a perfect Friday night treat! Eggs Benedict is the husbeasts favorite breakfast. I would never consider a sauce. Is it anywhere near as good as homemade? It's the first time we've had Eggs Benedict at home as the boys don't like eggs so I've never made Hollandaise myself. The Korma was really nice and quite change from the standard Korma sauces. I would never try to make my own hollandaise sauce so this sounds perfect. My favourite addition to a christmas meal is redcurrant jelly. Ooh - this company isn't based too far from where I live. The korma sounds really nice. haven't heard of these before, but they sound great. I always have a few things like this on hand! That korma looks yum-yum. I like the use of flaked almonds. I haven't hearof these before, that korma sauce looks delicious - I love a good curry.